I got together last week with Holly from Holly's Stamping Addiction to get a little crafty. With a few blocks of woods, some chalkboard paint, ribbon, a few buttons, brads, twine and chalk we made these cute chalkboard blocks. They can sit on a shelf, countertop, etc. Since they are painted with chalkboard paint, you can write your daily menu on one or even change the message to your liking. 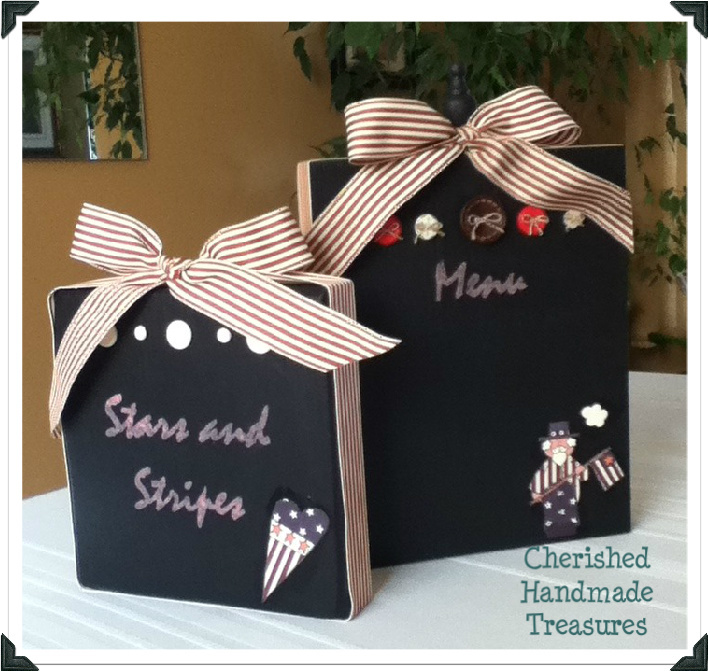 My D-I-L is remodeling her kitchen and has chosen an Americana theme, so I Mod Podged a couple of scrapbook cutouts onto a couple for her. The other I made for my daughter. Just a simple message that can be changed with the season, holiday or even just her mood. Have fun creating your own chalkboard blocks! 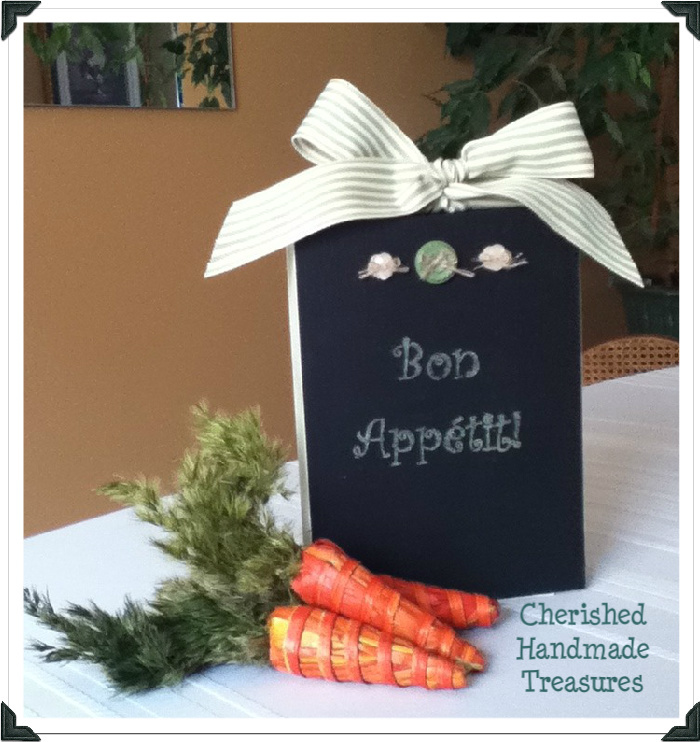 This project is being shown off at the Take it on Tuesday linky party. I love this idea...I wish I had more counter space.. Ah...maybe someday when the kitchen gets a real makeover or I move! Love the blocks and the way you embellished them too!! These are so lovely; great job! This is such a cute idea and I can think of lots of ways to use them. I'm getting around and stopping by from the Stop, Drop Alexa hop. I also joined your friend linky why I was here and voted for you on the Top Mommy blog. Your chalkboard blocks are adorable! I am off to check out the list of items needed. Thank you for sharing. These are adorable- how cool that you can customize them in so many ways- from the ribbon to the buttons to what you write on them! Thank you for sharing this adorable project at Inspire Me Monday at Create With Joy! This week's party is now open and you are one of my Featured Guests! I hope you'll stop by and share your latest creations with us again this week. Thanks so much for inspiring us! You have such a cute blog! The chalkboard blocks are adorable - nice work. I'm so glad you found my blog and linked up. I hope to see you next Tuesday. I'm your newest follower!! Thanks, Joy. We had a great time making them. These are so cute, I love them, and they sound really easy to make. Thanks for the idea. Thanks! I'm glad you like them. They were very simple to make and so much fun.